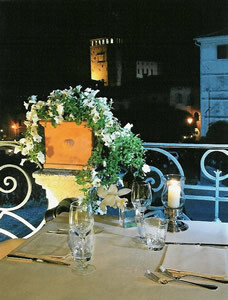 Asolo has long been regarded as one of the most enchanting places in Italy. Perched on a hilltop in the verdant land north of Venice, this ancient walled town was given in 1489 to Queen Caterina Cornaro by the Venetian Republic, after it had obliged her to abdicate the throne of Cyprus. The dear lady set up a court of some magnificence, and its members – with little to do with their time – passed their days by thinking about love and art. My own thoughts were a trifle more prosaic. I wanted a good dinner. And I found one – at the Ristorante La Terrazza in the Hotel Al Sole. This hostelry, but a few steep steps from the town’s central piazza, won me over as soon as I stepped inside. Everything sparkles like the proverbial new pin. Someone, I thought, is taking a real pride in this establishment. I was right. It is now run by the two daughters of the gentleman who restored the place ten years ago. And Silvia and Elena De Checchi seem to making a jolly good fist of their inheritance. I noticed a small vaulted chamber, off the entrance hall, lit by a dozen candles. This was the ‘Bacchus Room’ – used for ‘wine-tasting dinners’. I began to realise that the folk here were seriously interested in food and wine. I also began to feel very hungry. I found the restaurant on the first floor. It has a pretty little terrace with views over the town, but the inclemency of the weather kept me indoors. This was no penance, for the dining room – with its polished wooden floor, round tables and cream tablecloths – proved a comfortable environment in which to eat. The waiters and waitresses looked stylish in their black outfits, the glassware was decent (made by Bormioli, an Italian firm, new to me) and even the canned music, by Mr Verdi, was acceptable. 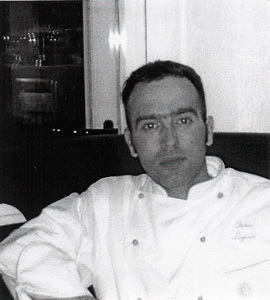 I sensed that my fellow diners were happy and that this had much to do with the charm and efficiency of Elena De Cecchi, the sister who manages La Terrazza. The wine list is short – just 55 offerings. But how I wish all cellars yielded up such good value. If you like the best champagne, what about 1997 Cristal for 180 euros? Or, if the local bubbly is to your taste, what about a bottle of prosecco for 12 euros? I counted 14 wines under 20 euros. The most expensive still wine is a 1999 Barolo (Brunate, Brico Rocche) at 73 euros. My own two bottles cost, together, all of 33 euros. I must recommend to you the red from the Veneto. Straightforward of structure, but bursting with glorious, ripe black fruit, it really was difficult to believe that the 2001 Raboso del Piave (Cecchetto) was only 18 euros for a whole bottle. Asolo can not only offer beauty, enchantment and history: it can also – thanks to the Ristorante La Terrazza at the Hotel Al Sole – provide good food and wine at bargain prices. No wonder I am keen to return. 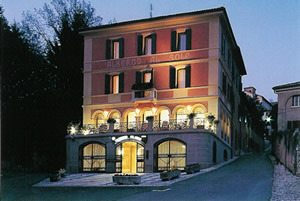 Hotel Al Sole, Via Collegio 33, Asolo 31011, Italy.